The BSO announced two new albums this week. 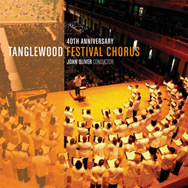 I’m looking forward to hearing the Carter, and am ordering multiple copies of TFC: Celebrating the 40th Anniversary of the Tanglewood Festival Chorus. Not because it’s my chorus (I’m not on the disc–these were small group recordings that went through the year I started with the chorus), but because the repertoire is astonishing. A pair of Bruckner motets, including the Christus factus est, the Lotti Crucifixus, the Frank Martin Mass, and of course Copland’s In the Beginning. Of course there’s a small irony–the cover photo shows the group holding music! But it’s a great image of a large Prelude concert group in Seiji Ozawa Hall. One of these days I’d love to be in that setting; our Prelude performances have been done by small groups since I joined the chorus, so I’ve never performed in Ozawa. Great tips! I hope there is another such TFC recording made while you are involved. Previous Previous post: Grab bag: Monkeybagels!